DENVER, CO - If you're a singer from the cattle industry who can perform the National Anthem with precision, and if you would like a free trip to the 2019 Cattle Industry Convention and NCBA Trade Show January 30 through February 1, 2019, the National Cattlemen's Beef Association would like to hear from you. The organization is conducting its fifth annual National Anthem Contest, sponsored by Norbrook. Any member of NCBA, the American National CattleWomen, the Cattlemen's Beef Board, or their children are eligible to participate in the contest. This year there is no age limit for entry. Contest winner will perform the Star Spangled Banner at the convention's Opening General Session January 30, as well as the Cowboy Concert Series Friday Night Event February 1. They will receive round trip airfare for two to New Orleans for the convention, a hotel room for four nights, free convention registration for two, plus a pair of boots, pair of jeans and a shirt from Roper or Stetson. 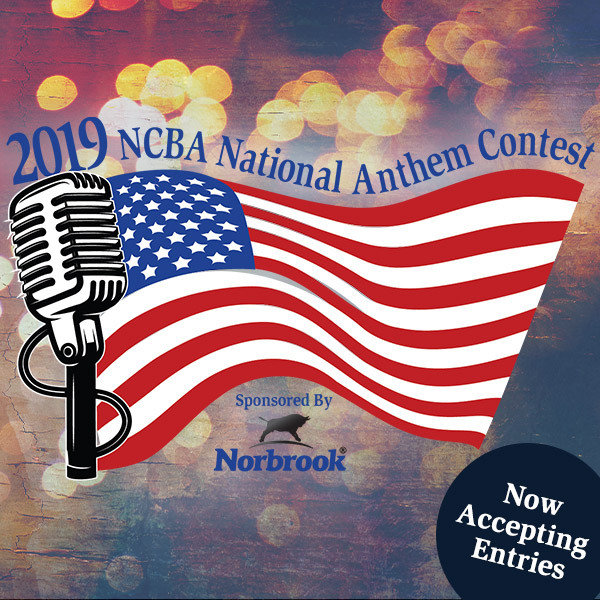 Previous NCBA National Anthem Contest winners are not eligible. Entries are being accepted through October 19, 2018. Top four finalists will be chosen by October 26, 2018, and videos will be posted to the convention website atwww.convention.beefusa.org. Voting will be open from November 1, 2018 to November 30, 2018 (one vote per person per day). The winner will be announced December 5, 2018.